I made eye contact with the women in the crowd and smiled at them and to my surprise the smiled back, even giggled and seemed somehow embarrassed. 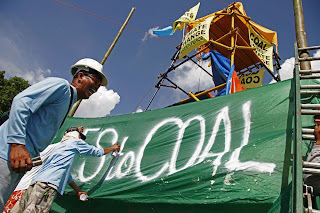 Most of them had spent the afternoon with us while their children had coloured in pictures of the Rainbow Warrior with our Quit Coal message. Three women seemed more serious though and tried to agitate the crowd. My heart was beating. Not the right moment to sit down and have a discussion about Climate Change. Just repeating that we are here to protest peacefully, smiling and calming down the crowd. I can understand that they want the jobs at the power plant and the money the company promised to invest into schools. However they will be the ones first feeling the impacts of climate change and won’t have any resources to adapt. I have to tell myself that many people in the community are against this plant and that this is also more than just a local issue. It seemed hours before they left. They might come back though today.